"This year’s epic of 280 shows around the capital may have been a celebration of jazz music, but it was an old rocker who provided one of the most poignant moments. 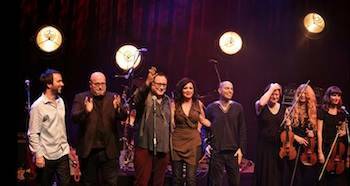 The saxophonist Gilad Atzmon, joshing his way through a fine show marking his 20 years of playing in Britain, introduced a surprise guest: “He’s a man who definitely defies every law of biology and physics . . . He’s better to play with than John Coltrane . . .” And on stage walked Wilko Johnson, the former Dr Feelgood guitarist who announced his terminal cancer to the world in January and whom medical experts confidently predicted would be dead by last month. Johnson, very much alive and doubtless surprised to be compared with an American saxophone shaman, proceeded to rattle out some searing rhythm’n’blues with Atzmon’s Orient House Ensemble as the evening reached a climax. Johnson says it could become embarrassing if his bookings continue into next year..."
"Gilad Atzmon, a relentless trouper, has surely played every jazz dive in Britain — so much so that it’s easy to take the saxophonist and his outstanding band for granted. The Queen Elizabeth Hall show celebrated the restless variety of his work: Scarborough Fair sounded like Coltrane if he’d made it to the North Yorkshire coast; a “homage to Leipzig”, with theorbo and viola da gamba, sounded like J. S. Bach via Tel Aviv. He performed lush Charlie Parker settings with the Sigamos String Quartet and staged a reunion of Ian Dury’s Blockheads with Johnson and the flying-fingered bassist Norman Watt-Roy. Atzmon signed off with Louis Armstrong’s What a Wonderful World, neatly poised between cheese and charm. The standing ovation was long and loud." Les Visible On The Seek-Speak and Spread Truth Conference.